The Civil War lasted four years. At its end, over 600,000 soldiers were dead. Much of the South lay in ruins. Yet, the Union had been saved and the practice of slavery abolished. On July 20, 1861, Union troops moved toward the Confederate capital of Richmond, Virginia, just 20 miles from Washington D.C. They met Confederate troops at Bull Run, a small river. The Union troops were unprepared and were chased back to Washington. Later that year, Northern troops again tried to take Richmond but were soundly defeated by General Lee’s defenses. The South seemed to be winning the war as Lincoln struggled with weak military leaders. In 1862, Ulysses S. Grant captured Forts Henry and Donelson, giving the North her first victories. Lincoln later appointed Grant as Lieutenant General of the Union army – a move that proved wise. July 1, 1863 was a terrible day for both sides. General Lee hoped that by invading Pennsylvania, he would convince the North to end the war. 51,000 men died at Gettysburg, Pennsylvania in a battle that lasted three days. When it was over, Lee led what was left of his troops back to Virginia. Behind him, a wagon train carrying the wounded stretched for 14 miles. General Lee was so discouraged that he tried to resign. Jefferson Davis, President of the Confederacy refused to accept Lee’s resignation. The Battle of Gettysburg weakened the Confederate army. General Lee’s only hope was to keep fighting until the Union army became weary of war. General Grant realized that he would need to completely destroy Lee’s army to end the war. He and General Sherman coined a strategy, “Total War,” which meant not only a fight against Confederate troops, but a war against Southern civilians. General Sherman’s troops marched to Atlanta in September, 1864. They destroyed everything in their path and burned the city. On April 9, 1865, General Lee met with Ulysses S. Grant to offer his surrender. A few weeks later, General Joseph E. Johnston issued his surrender to General Sherman. The war was over! Declan, Tobin. " 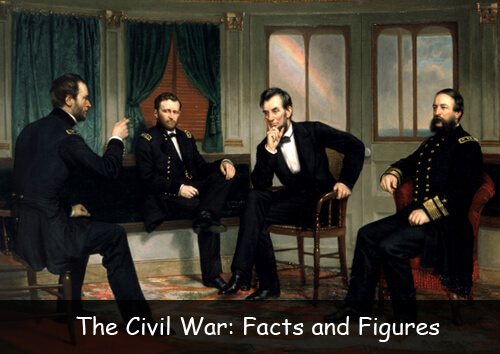 Civil War Facts for Kids - American History for Kids ." American History for Kids, Apr 2019. Web. 22 Apr 2019. < https://www.americanhistoryforkids.com/civil-war-facts-figures/ >.